West Papua - formerly known as Irian Jaya is attached to Papua New Guinea a sovereign state. The whole island of New Guinea spans 2400 Kilometers with the division at longitude 141 degrees. West Papua covers 421,981 Km2. Majority of West Papua topology is mountainous so traveling around can be difficult. The largest mountain in West Papua is Puncak Jaya, 4884m, part of the Sudirman Mountain Range. Puncak Jaya, meaning victory peak is listed as number 5 of the 7 summits mountain climbers want to climb. It is also regarded as the most difficult. West Papua has 3 National Parks. The largest is Lorentz National Park covering an area of 25,050km2 which is located close to the south coast close to Agats, Teluk Cenderawasih National Park 14,535km2 close to Manokwari and Wasur National Park 4138km2 which is located in the south close to the border with Pupua New Guinea. West Papua has the richest concentration of plant life in all of Indonesia and perhaps the world. Scientists estimate there are over 16,000 species of plants including hundreds of species that are of medicinal importance. Biologists have identified 643 species of birds, including the Victoria crowned pigeon (the world's largest pigeon), the beautiful birds of paradise, and the large, flightless cassowary. The fauna of West Papua is considered part of the Australian fauna province due to the existence of marsupials and monotremes similar to that found in Australia. During the ice age there was a land bridge connecting Australia with New Guinea resulting in the sharing of animal species. The population of West Papua is over 800,000 people making it the least densely populated region of Indonesia. There is a diverse range of ethnicity within West Papua with an estimated 250 different dialects spoken. Around Triton Bay near Kaimana, off the Raja Ampat Islands, and around the islands of Cendrawasih Bay are some of the finest and least disturbed coral reefs in the world. These coral reefs support over 3000 species of fish, some of the most diverse in the world, great for snorkeling and scuba diving. There are around 610 islands within the Raja Ampat and the reefs around these island support a diverse variety of both soft and hard coral. To reach the Raja Ampat Islands you need to first travel to Sorong in the far west of West Papua. Around these islands there is the Raja Ampat Marine Reserve, the Batanta Island Reserve and the N. Salawati Island Reserve offering great snorkeling and scuba diving. Entry into the Raja Ampat Marine Reserve is 500,000Rp (around US$45). Within Cendrawasih Bay lies the Cendrawasih Marine Reserve and further south from this location is the Pegunungan Wondiwai Wandamen Reserve. To reach here you'll need to catch a bus south from Manokwari. Several of the larger islands off the coast of West Papua also have Marine Reserves. 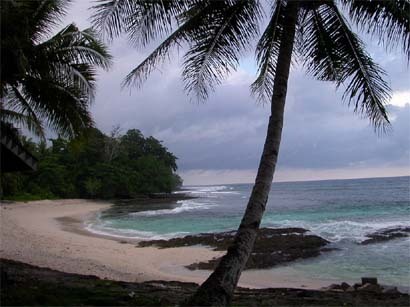 Biak Island to the north has Supiori Island Reserve and Northern Biak Reserve. Baun Island to the south of West Papua has the Baun Island Reserve and Aru Tenggara Marine Reserve though this island is harder to get to. Klub Golf Rimba Irian Course is an 18 hole, par 72, 6240m golf course, one of the remote championship golf courses in the world. Located at the foothills of Puncak Jaya Mountain. The capital city of West Papua is called Manokwari. There are airports in Sorong, Fakfak, Manokwari, Jayapura, Wamena, Merauke, Agats, Tanika in West Papua. There are no international flights into West Papua so you will need to get there from Jakarta or Surabaya. There are domestic flights from Manokwari's Rendani Airport to Surabaya, Jakarta as well to the other cities in West Papua Sorong and Ujung Pandang. Hotel Arfak is a budget hotel located on Jl. Brawijawa Manokwari. Contact phone number +62 962 21293 or (0962) 21293. Mutiara Hotel located on Jl. Yos Sudarso Manokwari. Ph: +62 962 21777 or fax: +62 962 21152. Ph: +62 (0)813 9265 0833 (Cell phone so possible to SMS for prices and reservations. Swiss-Belhotel Jayapura is a 4 star hotel in the centre of Jayapura. Hotel Mariat located in Sorong. Kri Eco Resort located on Kri Island Kri Eco Resort is a dive resort with bungalows suspended over the ocean.